When we design a custom pattern for your Master Suit, we're taking the time to get the details right on a 'trial basis' before we cut into the cloth you've chosen for your first suit. The most important factor in a custom suit is fit – and everyone's body shape is different. Which means that every fit is different. Which is why we don't believe in working off of pre-existing pattern templates. Through a unique fitting process we create a Master Suit pattern just for you, with a perfect fit for your unique body. After your initial measurements are taken, we craft a suit made from a lightweight material designed to drape in a way that shows the changes that need to be made. We call this your 'Master Suit'. It serves as a blank canvas to enhance the fit to ensure your garment drapes beautifully on your frame. Once this process is completed, your individual body pattern is on record and the reorder process is as simple as choosing the fabric and styling details you want for your next garment. With your master suit, we take the extra time to make sure we don't waste yours. Whenever I wear my King & Bay smoking jacket, people always approach me & ask about it. It is the most eye catching piece I have and I always save it for a special occasion. Really, anything goes with your Master Suit. We can keep trying and customizing until you’re delighted with the fit and style. We call this 'endless customization'. And, when it's all done, we will have a precise, custom template from which your actual suit can be cut and crafted. When it's time to order your next suit, the process becomes much simpler. This ease of re-ordering is a big reason why so many of our customers come back again and again. 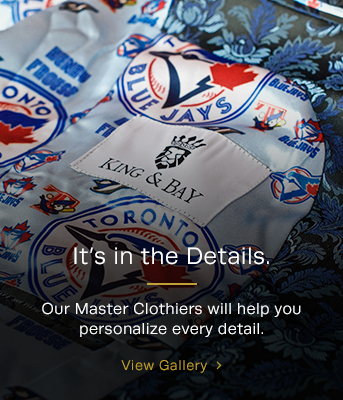 A Custom Suit From King & Bay Will Change Your Expectations Forever. Your Master Suit Is Waiting To Be Created. Let's Get Started!